A Wine Festival in Tirana. Are you ready to be part of it? In the evening of 8 September a great event named "Festa n'Shesh" will take place near Shesh Village, Ndroq. There will be a concert with singers dressed in folk costumes, a fair with products from the area, such as wine, cheese, olive oil and artisanal products from Tirana district. There will be a rich program with wine games, to entertain all the participants. A guided walk to the winnery will also be offered. 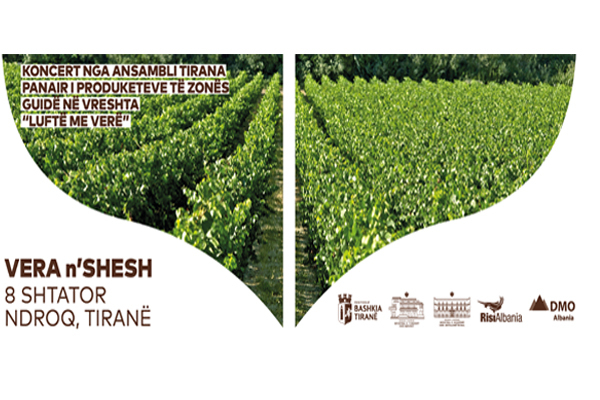 Shesh village is the one where the derivatives "Shesh i bardhë" and "Shesh i zi" grape originate. Let's be there and celebrate together with the finest produts from the area.